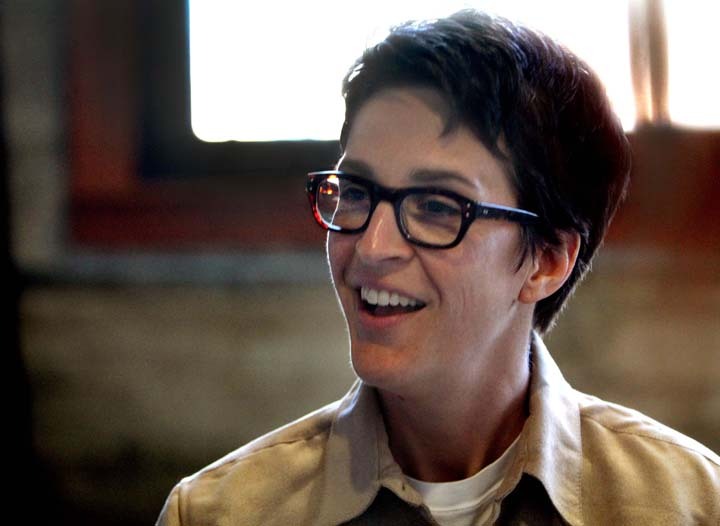 CVHS alumna Rachel Maddow has gone a long way since graduating in 1990. The Castro Valley native and television host explains politics to millions of viewers and interviews important national figures on The Rachel Maddow Show on MSNBC. While visiting the Bay Area to promote her bestselling book Drift, Maddow kindly gave an interview to her alma mater, talking about her hometown, her career, coming out and more. Balassone: Do you have any favorite memories from CVHS? Maddow: I’m sure I do, but I have to scare one up. I don’t really remember anything before I was 30… I was really into sports when I was at Castro Valley High. I was a three-sport athlete. I did basketball and volleyball and swimming. And so a lot of my memories are related to playing sports and the friendships with my teammates. It’s all kind of positive. I remember Rally being inexplicable to me: so much stress, so much extra work, and the cheering. I remember “Rally” being befuddling for me. That’s about it. Balassone: So, you were into sports, but why didn’t you take journalism or write for The Olympian? Maddow: Well, I never thought that I was going to end up in media. It was never in the cards for me at all. It’s not what I was aiming at. I’m not sure that I had a thing that I was aiming at when I was in high school, but I never thought I would do that. So yeah, it was as much a surprise to me as I think it was to anybody else who knew me when I started doing radio when I was 26. Balassone: So, if you had no certain ambition to go into media, how did you come across that? Maddow: I was doing odd jobs. I was a grad student, I was getting a Ph.D. at Oxford and I ran out of money and I ran out of time before I was done with my dissertation. So I moved back from England to the United States and I was living with friends. And I was just literally doing odd jobs to pay the rent. I was doing landscaping, I was doing deliveries, I was unloading trucks, I was working at a coffee roasting plant, I was doing all sorts of crazy stuff. The friends who I was living with were fans of this local morning show, one of those wacky, crazy “morning zoo” morning shows. And the woman who read the news who was the sidekick on the show was leaving and they held open on-air auditions to replace her. And my friends who I was living with dared me to go do it! And I had nothing better to do, so I did it and I got the job and I started the next day. Maddow: Yeah, it was really weird. It’s not a career plan I would recommend. Balassone: How does it feel to interview such important and influential people in your job like you do on a day-to-day basis? Maddow: I think that interviewing is not my best skill. It’s funny… I have never written a book before. This is my first book and I am the subject of all these people’s interviews, like yours. And that’s not usually what I do. And I’m realizing, as I’m doing all of these interviews with a lot of really good journalists, that I’m not as good as I ought to be! I think the key thing about interviewing well is being prepared enough that you know to ask questions where there is some legitimate uncertainty about what the answer’s going to be. Don’t ask a leading question. If you know what the answer’s going to be, ask a different one. But also to be comfortable enough with your research and what you’ve known about this person before it started that you can listen so you’re not just waiting to start your next question. You’re actually paying attention and getting what’s important about it before you ask the next thing. I’m less intimidated by the people who I talk to than I am about the necessity to get it right. Balassone: Considering the major success of your book “Drift,” are you planning on writing any other books in the future? Maddow: (shakes her head) I don’t like writing, I don’t enjoy it. I mean, I have to write all day for my job and that’s okay. But writing for a book… I didn’t get a book deal because I wanted to write a book and then I figured out a topic. I only wrote this book because I had this thing that I needed to get off my chest and the only way I could say it was in book form. And there isn’t something else like that. So maybe I will, but I don’t want to. Balassone: You grew up in Castro Valley and then you came out as being gay when you were 17. So I have many friends in Castro Valley who have recently come out or are planning to do so. But, growing up in Castro Valley, they are definitely afraid to do so. They’re wary of this onslaught of criticism from people. Do you have any advice for those students? Maddow: Now I don’t know if Castro Valley now is like it was when I was growing up, but by the time I figured out that I was gay, I was leaving town anyway. But the prospect of coming out while I was still living in Castro Valley was absolutely terrifying. It was, for me, not a bad place to grow up and I had a great family and I think I had good schooling and all those things, but it was a really reactionary place. It was intimidating and it was violent. So I did not feel like it was safe for me to come out. Now, I don’t know if it’s still that same way. But I think regardless of how reactionary or threatening your environment is, if you are coming out as lesbian, gay, bisexual, transgender, or any other sexual identity like that that’s going to expose you to risk, the most important thing is that you do it on your own terms. And nobody pressures you either into being in the closet, nobody pressures you into coming out. You do it when it is right for you. My main message is that, and this is a cliche now, but it does get better. If you are gay and you feel like it’s really hopeless and you feel like you’re not going to have a good life because you’re queer, because you’re different in some way, I understand why you feel that way as a teenager. It’s not like that as an adult. You can have a really awesome life as an adult. But you have to be true to yourself. Do things on your own terms. Be strong. Balassone: And, one last question. So, I understand that you did a commencement address at your Castro Valley High graduation. 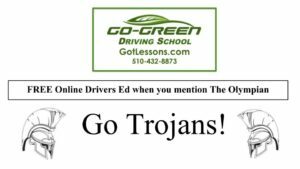 Balassone: So I was wondering, if you could give a commencement address to the Class of 2012 today, what would you say to Castro Valley? Maddow: I would hand it over to you! (laughs) Obviously you guys know more about what the milieu is like there and what you guys ought to be aiming at. Listen, I think that there are a lot of blessings of growing up in California in this time with a good school to go to and with all the resources that are available to us. And the more I’ve traveled the world and the more different parts of the country I’ve gone to, the more grateful I am that I am from here. So, if I could go back and give myself a lecture, go back to 1990 and tell myself something, I think I would tell myself to cool it and be a little more thankful for what we’ve got because we’re pretty blessed. This is so cool. Good questions and thoughtful responses. Thank you.